A delicious and creamy slow cooker chicken quesadilla soup with quesadilla “croutons.” This easy chicken quesadilla soup recipe is sure to be a huge hit! 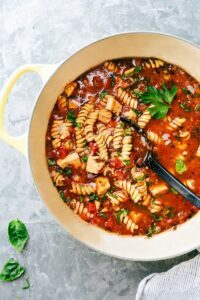 Both of my boys will tell anyone that their favorite soup is tomato basil. It’s pretty cute to hear out of the mouths of such little guys, but they also aren’t messing around. I’ve never seen anyone eat as much tomato basil soup as my toddler can and the babe can definitely put down some grilled cheese (that has been heavily dredged in tomato basil soup). So whenever I try a new soup out, they whine to just have tomato basil instead. While I know they love the actual soup, I think they like dipping rolls, grilled cheese croutons/quarters, or bread in the soup the most. So, in attempts to get them to eat a different soup I thought of a variation on grilled cheese croutons — quesadilla croutons! Sure enough, I served up bowls of this chicken quesadilla soup to hear the complaints that they wanted tomato basil instead and “didn’t like this soup” (that they’d never tried). But the minute I whipped out some quesadillas (some cut into croutons and others cut into large quarters), they were willing to give it a try. And, I’m happy to announce, we now a have a contender for the famous tomato basil soup!! Everyone, including the boys, LOVED this soup. 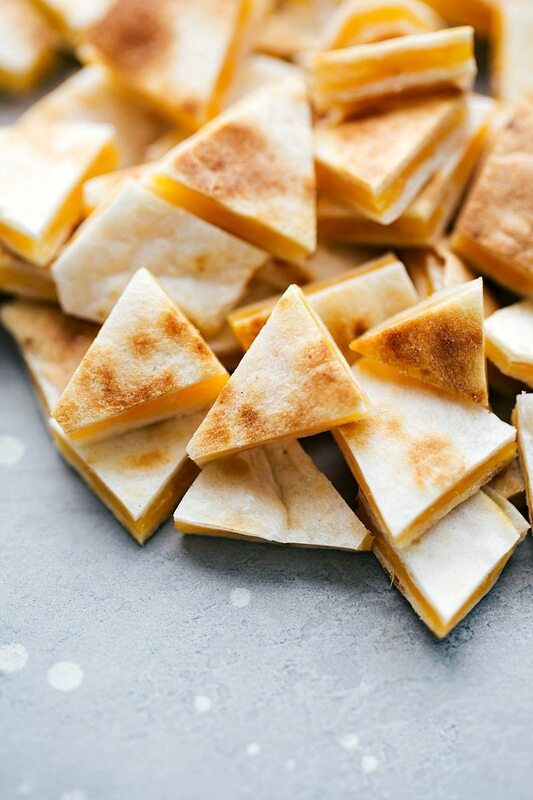 While the mini quesadilla croutons are certainly fun and we love them, it’s also equally fun (and time saving) to cut the quesadilla into large quarters and dip them in the soup. The kiddos liked the croutons best, but I’ll admit I liked the bigger quarters of quesadilla to dip into this soup! 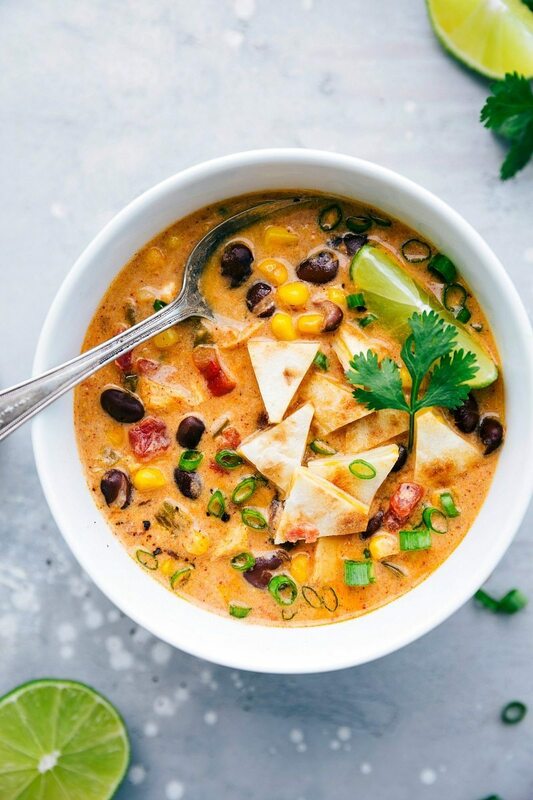 Although I’ve talked a lot about the quesadilla “crouton” addition, I can’t miss talking about this soup because it is absolutely delicious. 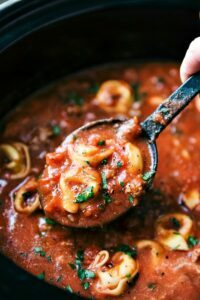 I know I’ve been calling it a “soup” for this entire post, but be aware it is more the consistency of a chili or very thick soup. I didn’t want to call it a chili, because it doesn’t really have “chili” ingredients, but it is definitely a thick and hearty “chili” like consistency. And besides the quesadilla croutons or quarters, the actual soup is quesadilla inspired — it’s got all the ingredients of a great quesadilla — shredded chicken, peppers, onions, tomatoes, black beans, corn, and plenty of Mexican seasonings. And it’s also got all the great toppings of a quesadilla! 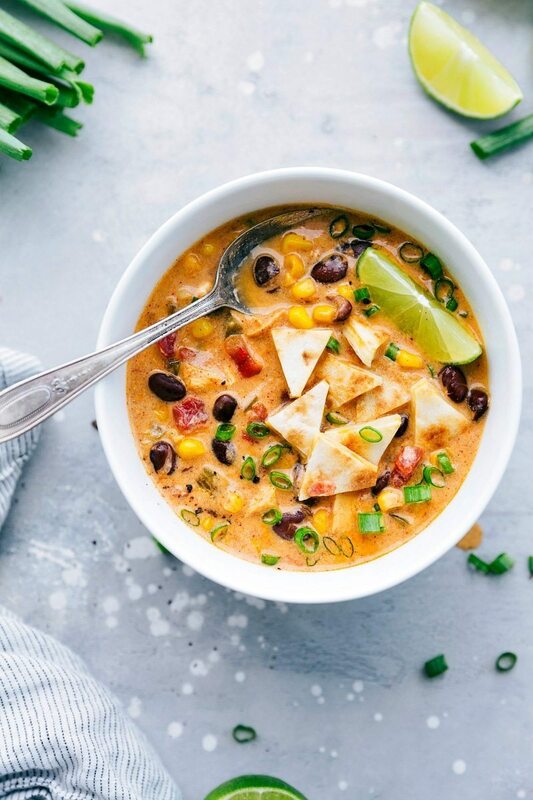 We top this soup with a generous spoonful of sour cream, a huge handful of Colby Jack cheese, a squeeze of fresh lime, and plenty of green onions. 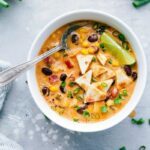 With all these toppings and the quesadilla croutons or quarters, this is a seriously hearty quesadilla soup the whole family will love! A delicious and creamy slow cooker chicken quesadilla soup with quesadilla "croutons." In a large crockpot (I use a 6 quart crockpot), add in the diced green pepper, diced onion, uncooked chicken breasts, enchilada sauce, undrained tomatoes, drained and rinsed black beans, undrained corn, chicken stock or broth, and minced garlic. Add in all of the seasonings: the cumin, paprika, seasoned salt, pepper, and chili powder. Stir well and cover the crockpot. Meanwhile, cube the cream cheese into small cubes (it should be very softened -- melt in microwave) and put them in the crockpot. Stir well and cover. Change temperature to high. Let it sit for a few minutes and then using a large whisk, briskly whisk the cream cheese to melt. Add the shredded chicken back into the crockpot. Stir and cover. Cook on high until all the cream cheese is completely melted. Whisk once more. Meanwhile, make the quesadillas. Warm a large skillet over medium to medium-high heat. Lay one tortilla in the skillet and sprinkle all over with 1/2 cup of cheese. Once the cheese starts to melt, lift a corner of the tortilla and check the underside. When the cheese is all melted and you see golden-brown spots on the underside of the tortilla, fold the quesadilla over in half and remove to the cutting board (I do cook these to very crisp since they'll be in soup/dipped in soup). Repeat until all the quesadillas are made. Cut into large quarters or smaller croutons. Serve hot with the soup! 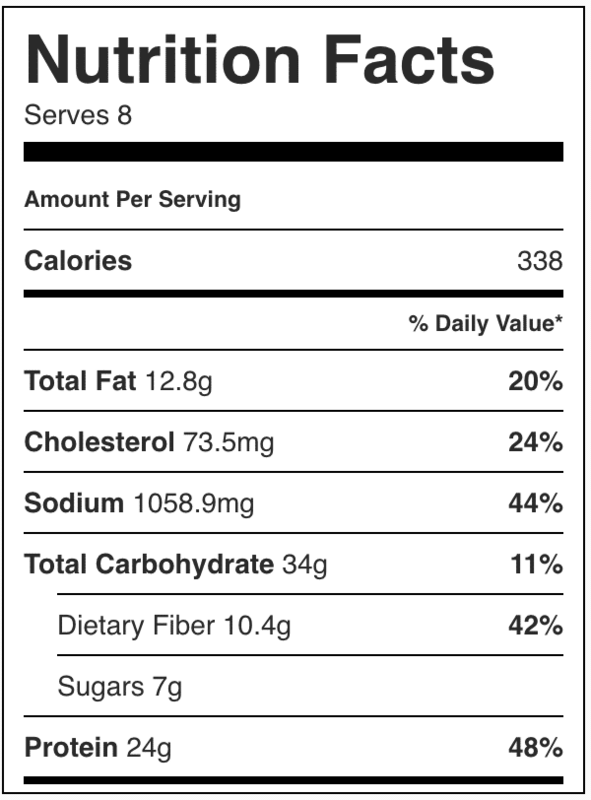 The nutrition label doesn't include the toppings or the quesadilla croutons since it is highly variable on what/how much you add. The label includes all of the base soup ingredients. This looks fantastic – perfect for the chilly fall evenings that are soon to be arriving! 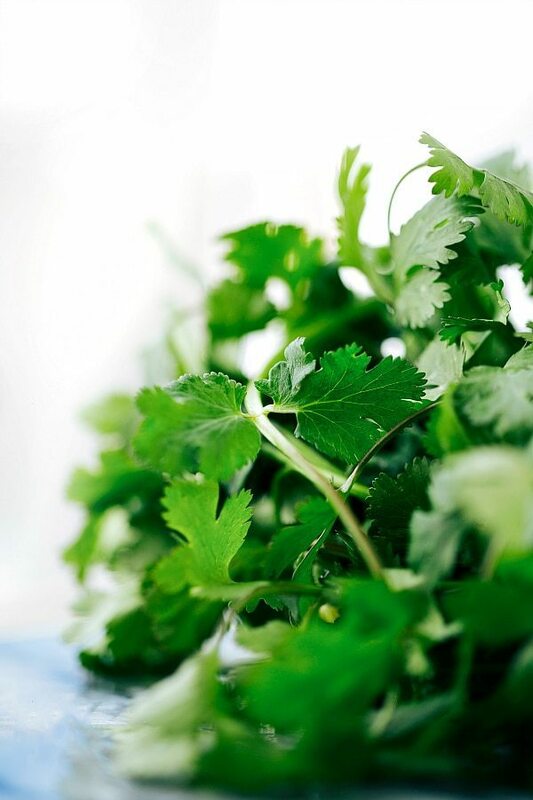 I’ve really got to get a slow cooker one of these days…but until then, I’ll just have to make this on the stovetop. Yum! I’m a soup fanatic, and in the crockpot?! Even better! Looks delicious! 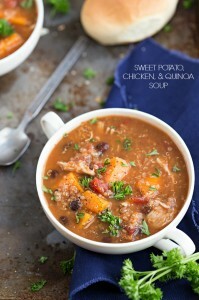 Crockpot soups are my absolute favorite this time of the year! Loveee this! I love crockpot soups! This one looks amazing!! Each slow cooker recipe you come out with sounds better than the next, Chelsea! The flavors in here sound absolutely amazing! I can’t wait to try this out, especially since I know my husband will love this, too. Pinned! You know how much I love soups. So of course this looks downright delish! This is in my slow cooker now, can’t wait to try it! This sounds fantastic, especially for the upcoming chilly months! I like how you covered all the bases by adding in the essential quesadilla items and turning it into a delicious soup. Quesadillas might be their own sub-section in my personal food pyramid, so this seems like it’s right up my alley! Does anyone know the calorie/ nutrition facts for this? hey girl- this looks so good! Yummy for my tummy! The most delicious thing that has ever come out of my crock pot is your turkey enchilada quinoa recipe… so I will definitely be trying this recipe ASAP. Thank you!! 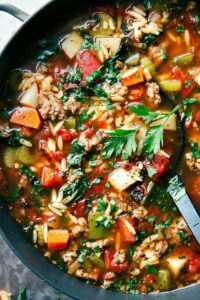 My family and I absolutely love this soup. I’m making some as I type this comment. So happy to hear that! 🙂 Thanks for the comment Nekeitha! Delicious recipe. Hadit for the first time tonight. Definitely a keeper. Thank you ? I want to bring this to a potluck tomorrow. Can I make it a day ahead? Does it reheat okay?